This means that his movies are (usually) harmless fun, but not the sort of thing you’d want to make a habit of. His preference for spectacle above all else goes a long way in explaining what’s wrong with this movie. One example: he actually found a way to put explosions in a film about Shakespeare. Anonymous, a film about the widely dismissed theory that Shakespeare never actually wrote anything, revolves around three main characters. There’s Edward, the Earl of Oxford (Rhys Ifans). His fortune dwindles as he spends all his time writing stuff like “Hamlet” and “Macbeth” but is unable to stage them for fear of further tarnishing the family name. There’s Ben Johnson (Sebastian Armesto), the playwright struggling to write a hit. The Earl wants his plays to be performed under Johnson’s name. Johnson is unsure about the idea. 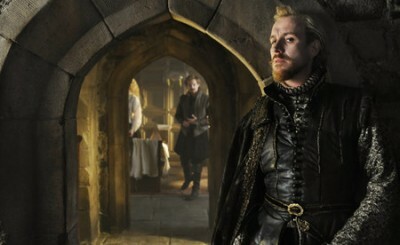 And then there’s Wild Bill Shakespeare (Rafe Spall). Like some unholy marriage between Captain Jack Sparrow and Pauly Shore, the Bard as he’s presented here is a cheap, drunk actor who spends most of the time fidgeting around and whining. God, how he whines. The problems with this character have nothing to do with ideas of Shakespearian blasphemy and everything to do with a human being’s capacity to tolerate irritation. Eager for fame, Shakespeare jumps on the chance offered by the Earl, and the rest is pseudo history. There are maybe a dozen more characters in this movie, all conceived with similar absentmindedness and executed to the best of their humble actor’s ability. But the worst part is the reckless time scrambling. We jump back and forth (then further back and further forth) so many times it’s impossible to keep events and characters straight until Robert Cecil (Edward Hogg) explains everything at the end. Here’s a tip: keep an eye on the beard of royal advisor William Cecil (David Thewlis). The greyness of it helps identify the time period. But then he dies, and you’re on your own again. Out of everything that’s been packed into this agonizing 130 minutes, Ifans is the one good part. His mourning eyes alone are able to inject the Earl with a depth of feeling found nowhere else in the picture. Something similar might be said for Vanessa Redgrave’s Queen Elizabeth I. She projects an appealing calmness when we see her, but Elizabeth is usually depicted in the film by Joely Richardson, as the frequently hysterical young Queen. Emmerich is a poster-boy for commercially minded filmmaking. So who is the audience for Anonymous? People who do puzzles without all the pieces? If you’re into Shakespeare movies, stick with Laurence Olivier. If you’re into Emmerich’s apocalyptic filmography, prepare to be just as disappointed.